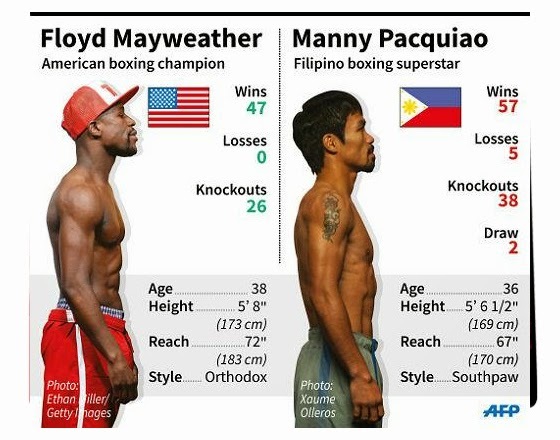 Pacquiao vs. Mayweather: Tale of the Tape - Balita Boss! WBC/WBA welterweight champion Floyd Mayweather Jr. will put his unblemished record on the line May 2 (May 3 Phl Time) when he steps into the ring against WBO welterweight champion Manny Pacquiao. Here's a look at the tale of the tape for Mayweather and Pacquiao ahead of their May 2 Fight of the Century in Las Vegas.